The Online Merchants Guild has big ambitions, which include negotiating better terms with Amazon, pushing the company to respond more effectively to sellers’ complaints and lobbying government officials to make sure merchants’ viewpoints are being heard. The millions of merchants who sell products on Amazon.com have long craved more leverage over their powerful benefactor. Now some are creating a trade association in hopes that a unified voice will force Amazon to take them more seriously. Organizers began pitching fellow merchants on the Online Merchants Guild last week at the Prosper Show, an annual Las Vegas conference that drew 1,900 Amazon sellers. The group is just getting started but has big ambitions, which include negotiating better terms with Amazon, pushing the company to respond more effectively to sellers’ complaints, and lobbying government officials to make sure merchants’ viewpoints are being heard. Chris McCabe, a former Amazon employee and owner of the consulting firm Ecommercechris.com, is organizing the guild with Paul Rafelson, a Pace University law professor. They plan to promote the group at Amazon merchant events in New York and Seattle next month. It’s early days, and only about 100 merchants have expressed interest in joining the association, which levies an annual fee of between $100 and $25,000, depending on the size of the business. Merchants have mulled such a group for years, but now have an issue to rally around. In recent months, states have been warning that they plan to levy back taxes on years’ worth of past sales. Merchants fear they’ll be easier targets than Amazon and hope a guild will give them lobbying clout. “There has not been one single issue to galvanize Amazon sellers like the sales-tax issue,” McCabe says. Merchants’ complaints about Amazon are numerous and long-standing. With 300 million customers around the globe, including its big-spending Prime subscribers, the world’s biggest online retailer wields tremendous leverage over the people who keep its web store stocked with an abundance of goods. Amazon can dictate terms and fees with minimal input from sellers, who have to accept the take-it-or-leave-it approach because there are millions of merchants and only one Amazon. Merchants love it when the orders are rolling in. They hate it when there’s a problem and Amazon doesn’t seem to care nearly as much as they do because it has plenty of other merchants selling the same things. Still, Amazon offers small businesses an easy way to access customers through its web store and vast distribution network. Amazon added more than 300,000 new small businesses as merchant partners in 2017, and over 140,000 of its merchants have annual sales exceeding $100,000. Even with an organized group, merchants could find it difficult to negotiate with Amazon, which typically resists collective bargaining. The e-commerce giant has had long-running disputes with the Author’s Guild and the Association of American Publishers over online book sales. And the company has managed to keep unions out of its U.S. warehouses. 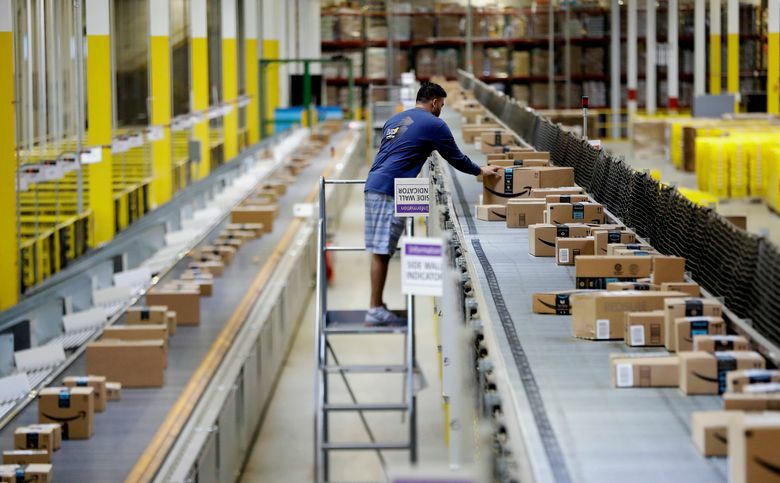 Merchants are also contending with Amazon’s growing political influence. The company has a big lobbying presence in Washington, D.C., and relationships with state lawmakers who doled out tax breaks in exchange for building new warehouses that create jobs. Amazon’s proposed second headquarters, which the company says will generate 50,000 new jobs over 15 years, has given politicians yet another reason to make nice with the online retailer. Amazon merchants fear their voices are drowned out by the company when policy decisions are made that affect their livelihoods and the future of e-commerce. They think an association will help them lobby more effectively. In addition to sales taxes, the merchants want to advocate for better protections against counterfeit goods that run rampant on online marketplaces, as well as trade issues like international postal rates that make it cheap for Chinese merchants to ship goods directly to U.S. shoppers. Merchants fear lawmakers don’t understand their business and the complexities of how Amazon operates. Beyond e-commerce policy, merchants hope an association will help them negotiate better terms with Amazon. Common complaints among Amazon merchants are that the retailer lacks adequate staff to handle their questions and concerns, which are routed to departments that often email irrelevant responses. Sellers also fear having their accounts suspended due to unverified complaints from Amazon shoppers or erroneous complaints lobbed by marketplace rivals bent on sabotage. Amazon’s focus on customers means merchants are guilty until proven innocent when a customer complains, cutting off sales for weeks while they navigate Amazon’s account reinstatement process, sellers say. Hundreds of trade associations form every decade, often in response to new threats such as technological innovation or an industry partner growing too powerful, says Lynette Spillman, a sociology professor at the University of Notre Dame who has studied trade associations. Mulch and soil producers have an association to help them negotiate with big retail partners like Home Depot, as do food-equipment manufacturers that sell products to large companies like McDonald’s. “The sales-tax issue, and more particularly how to handle it considering Amazon’s power as a distributor, fits this sort of origin story well,” she says.